Sorry for all the pumpkin posts lately, I just can’t help myself. I actually wasn’t going to post this recipe today, but then I changed my mind because after all, Thanksgiving is tomorrow and I am so thankful for this yummy bread. I have my favorite pumpkin chocolate chip bread recipe that I always make but I bought a new cookbook (surprise, surprise) and saw this recipe and thought I’d try it. Well I am happy to announce that I am 100% IN LOVE with this bread. 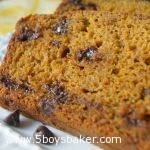 It is so moist and delicious and the best part is that it’s low fat. It only has one tablespoon of oil in it compared to my recipe that has a 1/2 cup of oil. If you tasted this bread and didn’t know it was low fat, you would never guess it in a million years . . .I promise! I’m pretty sure I ate half (okay maybe more than that) of the loaf all by myself —but hey, it’s low fat, at least that’s what I kept telling myself. Honestly, I couldn’t stop eating it and I can’t wait to make it again. In a small bowl, mix flour, baking soda, salt, cinnamon and nutmeg; set aside. In a large bowl, beat pumpkin, brown sugar, buttermilk, egg and oil. Add dry mixture, stirring just until moistened; do not over mix. Fold in chocolate chips. Pour into pan. Bake for 50-60 minutes or until toothpick comes out clean. Let cool for 15 minutes. For the glaze combine chocolate chips and oil in a small bowl. Microwave for 30-45 seconds until chips are melted. Stir and drizzle over warm bread. I left the chocolate drizzle off and the bread was still amazing. I just figured it didn't really need it.